Hardly a French Canadian tracking his genealogy back to the early middle seventeenth century doesn’t bump into one ancestor or another who was part of the First Nations people. Trading partners, allies, guides of the newly arrived French, these were people who had settled in North America many thousands of years earlier... members of Eastern Woodland Tribes. Usually these ancestors were women. Most often they were the wives/partners of fur traders and coureurs-des-bois who sometimes had two families… one in the French settlements of New France where the union was blessed by the church and the children duly baptized… the other family would be in and around the trading posts and forts of the Great Lakes. Just as often a fur trader might marry one of these young women in a religious ceremony and they would live as a family in one of the settlements… Montréal, Trois-Rivières, Québec. The children of all these families were known as Métis. The first ancestor is the daughter of a Nipissing woman and Jean Nicolet who lived among the Nipissing for seven years as a clerk, interpreter and intermediary for a company of wealthy French merchants. The girl, herself a Métis, was called Euphrosine Madeleine Nicolet. Euphrosine (also known as Madeleine) was born circa 1628. When Jean Nicolet returned to the French settlement of Québec around 1637 and married a French woman, it seems he brought Euphrosine with him. She was literate and could sign her name which she spelled UFroisine. Jean Nicolet died in 1642 in Sillery, Québec. The following year (1643) Euphrosine married Jean LeBlanc who was subsequently killed by the Iroquois in 1662. Euphrosine and Jean LeBlanc had at least 5 children, 2 of which achieved adulthood: Jacques born in 1648 and Madeleine born in 1652. My family descends from Madeleine. Shortly after LeBlanc’s death, Euphrosine married a second time to Elie Dusceau. It appears she had at least two sons with Dusceau, Louis born in 1663 and Simon-Pierre in 1665. Euphrosine-Madeleine died in Sillery in 1689. The second ancestor is a woman baptized as Marie Miteouamigoukoué who was born around 1632 in the Trois-Rivières area. She belonged to a Christian branch of the Weskarini who lived near the mission in Trois-Rivières under the protection of the French. At this time, the Iroquois were a constant menace to the French colonies as well as any of their Indian allies, so much so that the survival of New France was often in doubt. It was not until the Carignan Regiment arrived from France in 1665 could the settlers breathe a little easier. Marie’s first marriage was to a member of her band, a man called Assababich. They had at least three children together. However, in 1652 there was yet another horrific offensive on the part of the Iroquois, a raid that turned into a massacre, with the Iroquois winning the day. As a result, Assababich was killed and two of their children taken captive by the enemy. A daughter born in 1647, named Catherine, was baptized in November 1652 in Trois-Rivières, months after her father's death. Marie’s second marriage in the spring of 1657 was to one of the French soldiers who survived that terrible day in 1652. He was Pierre Couc dit LaFleur, a fur trader and an interpreter. This new family produced nine children: Jeanne (1657 - 1679), Louis (1659 – 1709) known as Montour, Marie-Angélique (c. 1662 – 1750), Marie (c. 1663 - ?) not living in 1666, Marguerite (1664 - ? ), Pierre (1665 - ? ), Elisabeth (1667 – 1750), Madeleine (my ancestor) (c.1669 - ?) married Maurice Menard in 1692, and Jean-Baptiste (c. 1673 - ?). This was a family steeped in the fur trading business. 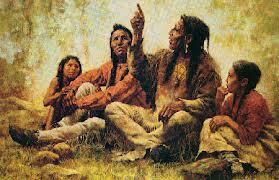 Sons, Louis and Jean-Baptiste married women from the First Nations. My ancestor, Madeleine married Maurice Menard who was an interpreter as well as a trader at Fort Michillimakinac. At least five of their children were born at Michillimakinac. The Menards were well-known and successful fur traders. Three of their sons, Antoine, Louis and François were traders also. Marie Miteouamigoukoué died in Trois-Rivières in 1699. Pierre Couc dit LaFleur died at St. François-du-lac in 1690. The author, Gordon Rainey is also a descendant of Marie Miteouamigoukoué.